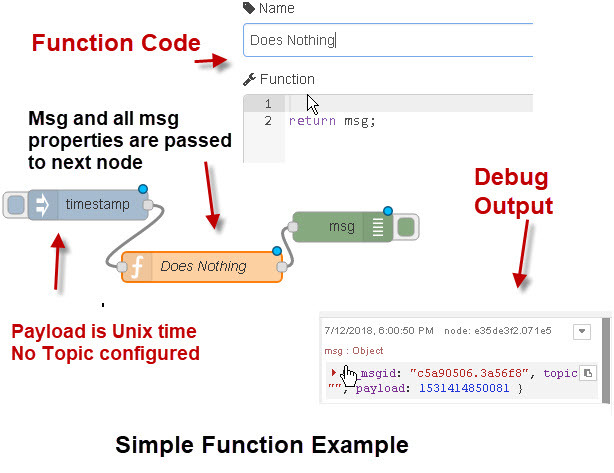 The function node accepts a msg object as input and can return 0 or more message objects as output. This message object must have a payload property (msg.payload), and usually has other properties depending on the proceeding nodes. Accessing the msg Properties in The Function Node. Now the msg object has a property called msg.newproperty. When you drop a function node onto a flow , and go to edit you will see a single line of code that returns the msg object and a blank line above were you can start to enter your own code. If you don’t return a msg object then the flow stops. 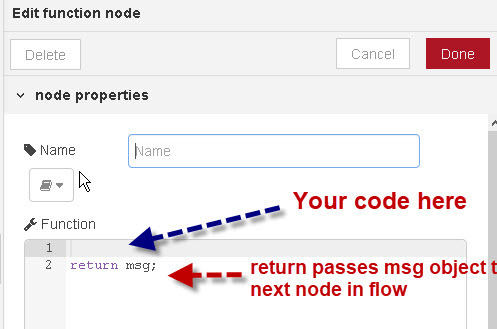 The flow below is uses the function node with the default code which simply returns the msg object. The effect is simply to pass the msg object and all of it’s properties from the input node to the output node and the next node in the flow (debug). The inject node injects a msg object into the flow with the Unix time stamp as the payload and a blank topic. It is passes through the do nothing function node and you can see that this appears on the debug node. 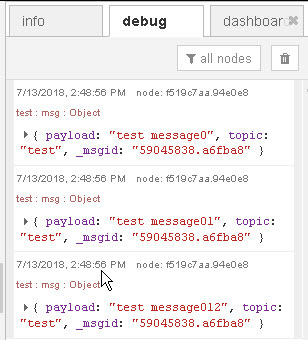 Next we use the inject node to inject a payload with the string “test string” and a topic of test. If we pass this into our do nothing function as before we get the following output. The output is as expected. 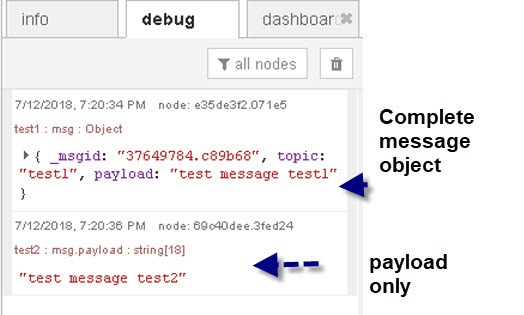 This time we show the topic as test and the payload as test string. The first line of the code retrieves the msg payload. The second line converts it to upper case and re-assign it back to the msg object. We then do exactly the same with the topic property before returning the complete msg object. Notice the topic and payload have been converted to upper case. The function node can be configured with multiple outputs. This is useful when the flow splits into separate paths depending on a message property. To configure multiple outputs open the function node and use the up/down arrows to adjust the outputs. Outputs are numbered starting with 1 at the top. Msg1 will appear on output1 and msg2 on output2. To stop a flow you return null. In the example flow we use two inject nodes to inject a message on two different topics and send the message to the output based on the topic name. Topic test1 goes to output1 and test2 goes to output2. The following code is used in the function node to spit the message path based on the topic name. 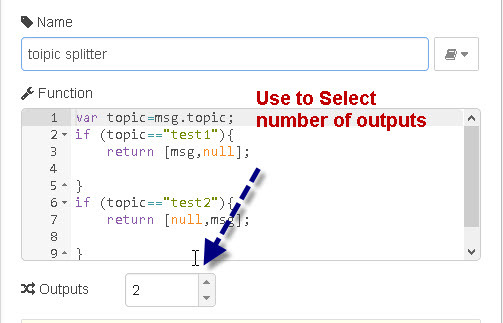 You can use an array to return multiple msg objects on an output. Important you are returning an array of objects in an array. In this example we use an inject node to inject a test string into the function node. 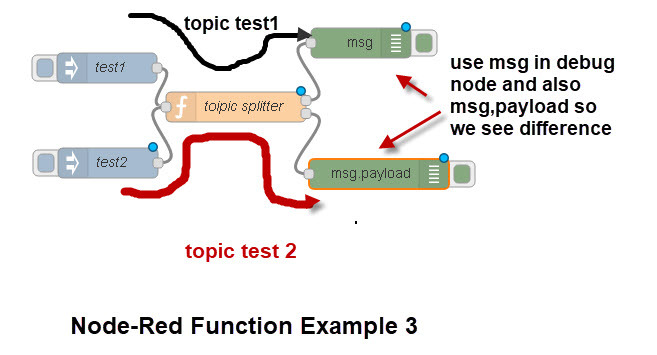 The function node takes the string and uses it for the message payload, but instead of sending 1 message it has a for loop which creates 3 messages and puts them in an array . The function returns the array as an array! Important– notice the return statement returns an array. Data can be stored in the function node using the context object. 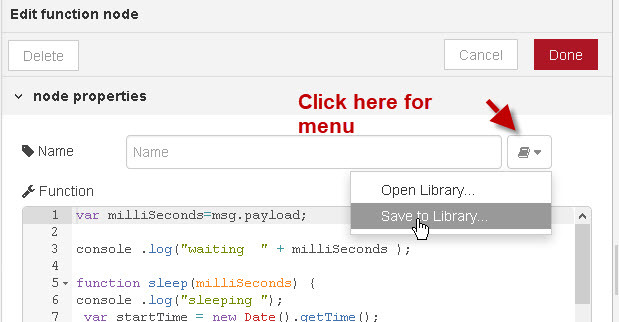 To save a function to the library double click on the function to edit it and click on the bookmark icon next to the function name. A drop down menu appears to either import or save the function to the library. See this tutorial on storing flows and functions for more details. You can also use a sub flow to store your functions. Using a sub flow makes them available as node which you can select from the node palette. See this video on creating and using subflows. I am new to node red, and an alien to JS. I have a message payload that contains a numerical array. I want to convert the payload to base64 string. Using the base64 node doesn’t work properly for arrays. Have you tried converting it to a string using the toString() method? I would just like the payload to have time in the format “hh:mm”, but I am unable to get it done. Look forward to your thoughts and response. Hi, perhaps you can help me. This is probably very simple, but i have been stuck for hours now..
You might want to read this as it goes into the msg object in more detail. Usually the msg object has a payload but doesn’t have to have one. Does that make sense? Does it work?